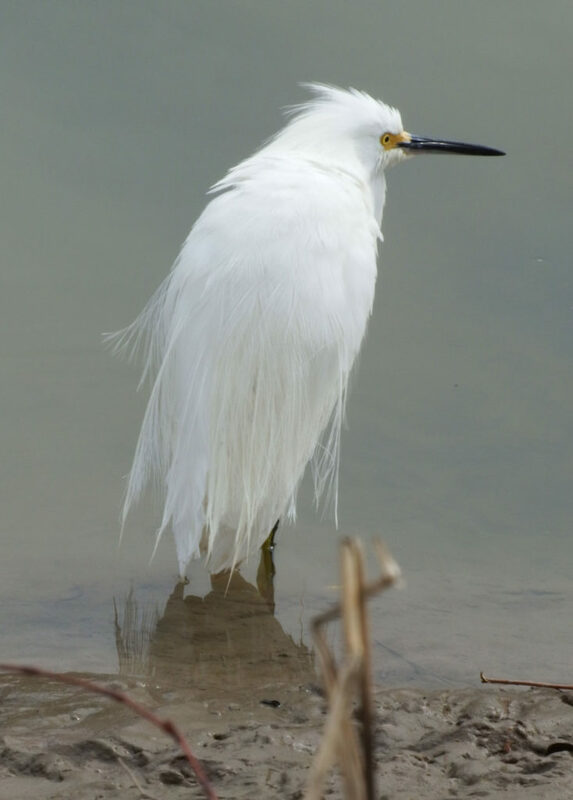 In this corner, we have the magnificent snowy egret, the most elegant bird in North America. This is the bird for whom the entire Audubon Society was formed. Hunted almost to extinction for its fabulous feathers, the snowy egret is now plentiful, a conservation success story. Snowies are energetic fish hunters who employ a variety of skills to nab a meal. They stalk slowly like a great blue heron; they use their yellow feet to stir up the bottom and catch anything that darts away; they can stand in deep water and vibrate their bill to attract fish hoping for a tasty insect instead of the doom that awaits; they have even been documented swooping down like a pelican to spear prey. 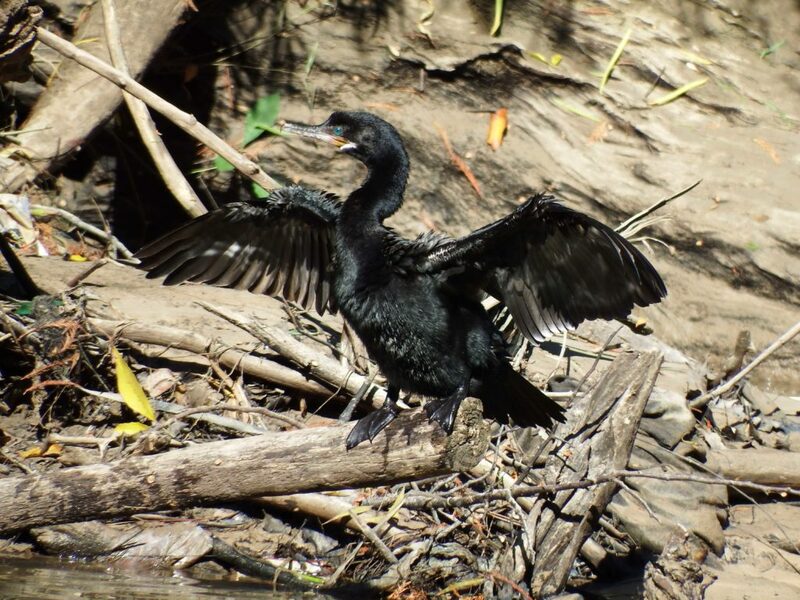 Air drying in a typical cormorant pose. In the other corner is the Neotropic cormorant. A bird of compromise that can fly, float and swim underwater. It does none of those things as well as birds that specialize in one of the three. A scrappy, ragged bird, cormorants get very little love. At stake in this competition are tasty fish. Rather large tasty fish and seemingly plenty of them. The action takes place on the north side of the bayou near the police memorial. The first video, will show the action at normal speed. 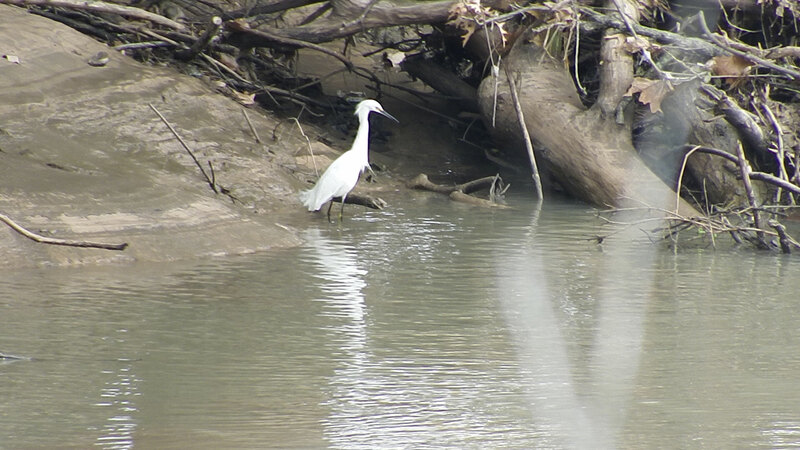 The snowy egret catches sight of a fish but before he can strike, the cormorant rises from the deep and gobbles it up. The snowy spots another fish and flies to get it, but before he can land, the cormorant again rises up and steals the fish. You can’t see it at normal speed, but the snowy does get a fish. That will be more apparent in the second version, where I have slowed everything down. Next: the same action, with some of the boring bits edited out. You can see the cormorant swoop in to catch the fish and you can see that our beautiful snowy egret does not go hungry. I can easily award two fish to the cormorant and one fish to the snowy egret, which gives the match to the cormorant by a gill. But I honestly think the score was worse than that. I think that cormorant got three or four fish. It was moving so quickly that I wondered if there weren’t two of them. Come to think of it, we do have a pair living very near that spot. So you do have to wonder whether those cormorants let some air out of the ball. 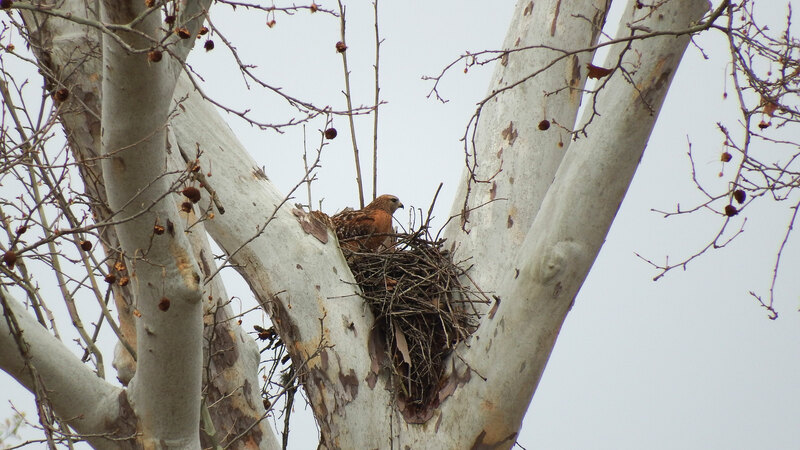 Last week I wrote about a nest being rehabbed by a pair of red-shouldered hawks. The nest was quiet each time I visited for a few days and I wondered if the hawks had chosen another site. Nope! This week, one of the hawks was back adjusting sticks. Both male and female red shoulders will work on the nest, so I don’t know if this is mom or dad. But whoever it is, they care deeply about stick placement!